Multiple myeloma (MM) is a relatively rare malignant hematological disease, which is characterized by a monoclonal malignant proliferation of plasma cells that causes osteolytic lesions. 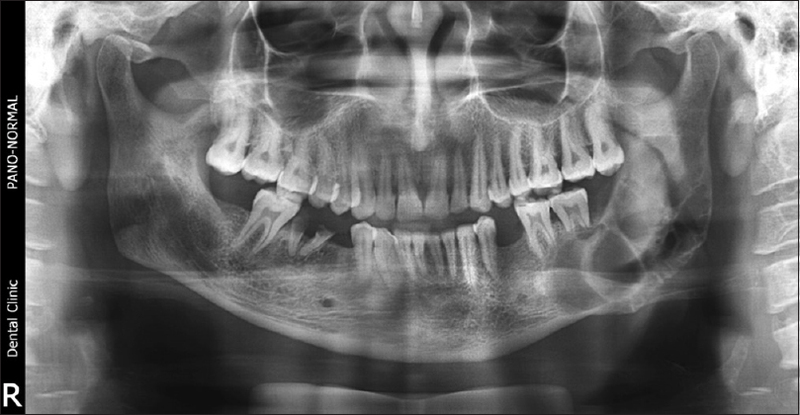 Maxillofacial presentations in patients with MM are not uncommon, but because the symptoms are varied, it is very difficult to diagnose MM in this region especially in patients with initial oral involvement. Furthermore, maxillofacial manifestations as an initial sign or symptom are scarce. We report a case of a 40-year-old male patient who presented with an unhealed socket in lower left back tooth region for the past 2 months. The panoramic radiograph revealed a multilocular radiolucency. Histopathological examination of the biopsy specimen revealed a malignant hematopoietic neoplasm formed by plasmacytoid cells. Radiographic survey and immunoreactivity for CD 138 and lambda chain antibody further confirmed the diagnosis of MM. Multiple myeloma (MM) is a relatively uncommon malignancy of plasma cell origin that often appears to have multicentric origin within bone. This disease makes up about 1% of all malignancies and 10% to 15% of hematologic malignancies. It is difficult to estimate the prevalence of oral manifestations as the initial feature of this disease because most cases are presented as case reports or in retrospective studies. Its presence in jaws is not a rare condition, but oral lesions rarely occur as the first sign of the disease and when present, angle and ramus of the mandible is the most common site., This report presents a 40-year-old male patient diagnosed with MM from the primary manifestation of an intraoral lesion. A 40-year-old male patient reported with the complaint of an unhealed socket for 2 months. 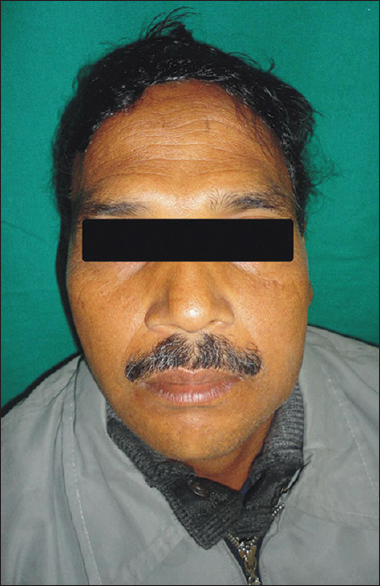 The patient gave the history of mild lower facial swelling on the left side for 3–4 months, which was diagnosed as a case of cellulitis, and treated by extraction of the third molar on the same side 2 months back by a local dental practitioner. He also gave the history of troublesome bleeding during extraction, which was managed by local measures and complained the numbness present on lower lip following the extraction. He also complained of fatigue, malaise and mild backache. Extraoral examination revealed an ill-defined, hard, nontender swelling present over the lower third of the face with no surface changes [Figure 1]. Intraoral examination revealed an unhealed extraction socket in mandibular left retromolar area, associated with mild buccal cortical expansion and vestibular obliteration, extending till 36. The panoramic radiograph revealed a multilocular radiolucency extending from the mandibular ramus area till mesial aspect of 36. The lesion had caused the resorption of roots of 36 and 37 [Figure 2]. The three-dimensional computed tomography (CT) image also showed a large osteolytic lesion demonstrating the complete erosion of both buccal and lingual cortex [Figure 3]a and [Figure 3]b. All the hematological tests were performed and found to be within the normal limits except for mild anemia and raised erythrocyte sedimentation rate. An incisional biopsy yielded a red beefy colored tissue. Excessive bleeding was noted during biopsy and was controlled by pressure packs. Histopathological examination of the H and E sections [Figure 4]a and [Figure 4]b revealed round to ovoid cells with hyperchromatic eccentrically located nuclei and granular chromatin arranged in a “cartwheel” fashion, arranged in the form of sheets of monoclonal appearing cells plasmacytes. Perinuclear halo was evident in few cells. 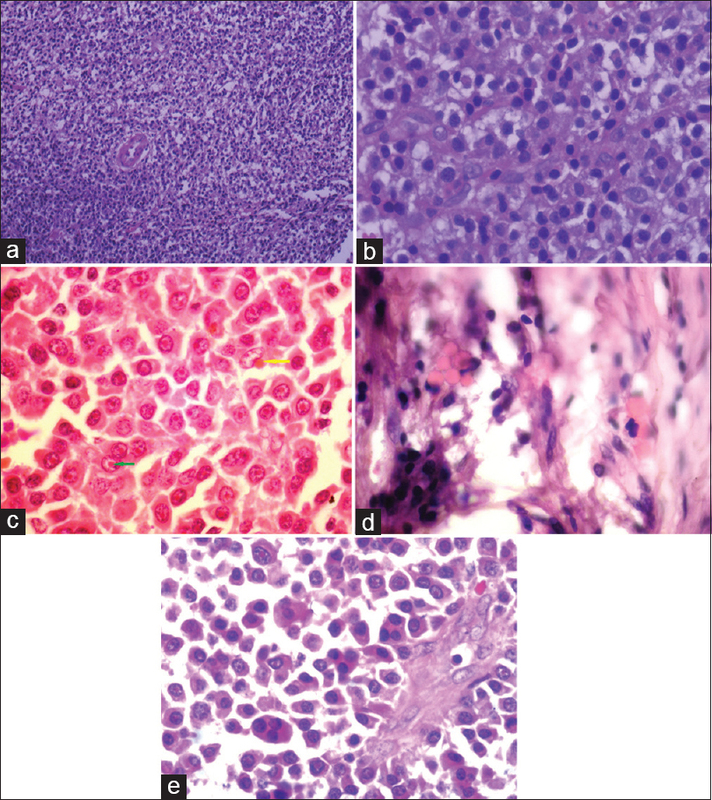 Few cells were shown to possess eosinophilic crystalline inclusions such as Russell bodies, Dutcher bodies, Mott bodies [Figure 4]c and [Figure 4]d. Atypical plasma cells with many binucleate, trinucleate and multinucleate forms were also noted [Figure 4]e. The histopathological diagnosis made was plasmacytoma, and the patient was reinvestigated for MM. 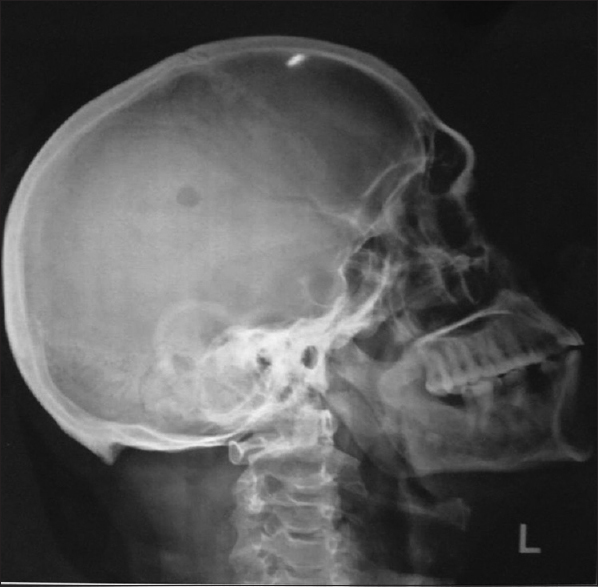 Lateral skull radiograph revealed a solitary punched out lesion of the parietal bone [Figure 5]. Skeletal radiographic survey failed to show additional osteolytic lesions. 24 h urine Bence-Jones protein immunoelectrophoresis was negative. Immunohistochemically, the malignant plasma cells were strongly positive for CD 138 and lambda chain antibody [Figure 6]a and [Figure 6]b. The skeletal radiographic survey and the immunohistochemical findings confirmed the final diagnosis of MM. Plasma cell myeloma (plasmacytoma) is a B-cell lymphoid neoplasm and may present as one of three distinct clinical entities: MM, solitary plasmacytoma of bone and extramedullary plasmacytoma. The relationship between localized form and MM is not completely understood, but 36%–85% of solitary plasmacytoma may develop into MM. Samual Solley in 1844 first described a well-documented case of MM, and the term “MM” was coined by J. von Rustizky in 1873. MM is also known as Kahler's disease (after Otto Kahler). MM is the most common primary malignancy of bone. On radiographic evaluation, jawbone lesions appear mostly as “punched-out” osteolytic lesions, although generalized osteoporosis may also be seen. The most frequent radiographic characteristics in MM are osteolytic lesions with a “soap bubble” appearance,, as was observed in the present case. The diagnosis of MM may be established by laboratorial examinations, such as hematologic, biochemical findings, urine analysis and skeletal radiographic survey. The calcium, renal, anemia and bone lesions (CRAB) criteria were examined, and only anemia and bone lesions were observed. Anemia is probably related to hemolysis due to the excess of paraproteins, although no myeloma proteins in the urine were observed in the current case. The diagnostic criteria for MM include evidence of multiple osteolytic lesions, identification of an atypical plasma cell population on biopsy and abnormalities of immunoglobulin production. Hence, based on the histopathology, immunohistochemical reaction and osteolytic lesions on the radiographic survey, the diagnosis of MM was given. Morphological features of the neoplastic plasma cells are highly variable, ranging from plasmablasts with a prominent solitary nucleolus to mature looking plasma cell. Several classifications have been reported, demonstrating the morphology of plasma cell as a useful prognostic factor, independent of or in addition to other biologic values. Unusual aberrations of the nuclei and cytoplasm were reported in these instances including cleaved nuclei, multilobated nuclei and/or giant cells, tadpole-like cells, monocytoid nuclei, nuclear pseudoinclusions (Dutcher bodies), cytoplasmic Ig inclusions (Russel bodies), spherical inclusions packed in their cytoplasm (Mott bodies) clear cytoplasm, signet ring cells, flaming cytoplasm, cytoplasmic vacuolation, erythro- or iron-containing plasma cell, phagocytosis and cytoplasmic crystals. Whereas prognosis was clearly related to nuclear changes, no prognostic value has been related to cytoplasmic anomalies mainly because each of the latter are too occasional. Bone pain, especially back pain is a major symptom reported by patients, attributed to osteoclast activating factor, a lymphokine, responsible for bone changes. Bone lesions are induced by neoplastic cells in bone marrow (i.e., neoplastic plasma cells) which release osteoclast activating factor, so inducing osteoclasts activation. Glucocorticoids administration may be helpful in the management of bone pain. The patient described in the present case also had mild lower back pain which may be explained by bone resorption activity, although radiographic survey revealed no osteolytic lesions except in the jaw and skull bone. An increase in vascular endothelial growth factor, transforming growth factor beta 1 and interleukin 6 (IL-6) levels have been found in patients with lymphoproliferative disorders. IL-6 is considered as the principal growth factor in the pathogenesis of MM. Furthermore, an increased level of endostatin has also been found in active phases of MM. Furthermore, osteopontin, produced by both osteoclasts and osteoblasts seem to play an important role in accelerated bone loss in myeloma. There are a number of concerns for the general dental practitioner with regards to treating a patient with MM. Bleeding tendencies occur as a result of thrombocytopenia and from high levels of the abnormal circulating proteins, which interfere with coagulation., The cause of excessive hemorrhage during biopsy in the present case is not known as the hematological investigations revealed no abnormal findings. Although it may be related to neovascularization of the lesion. Renal failure may also occur as a result of excessive serum proteins. Susceptibility to infection increases as immune paresis occurs, and the level of circulating, normal immunoglobulins, decreases. If a patient is to undergo dental treatment it is vital to determine their current renal status and medication. Chemotherapy and steroid therapy affect the patient's bone marrow and adrenal function, respectively. Elective dental treatment should be avoided and ideally be performed when the patient is in remission. MM is not curable; however, the prognosis of the patient depends on the stage of the disease at the time of diagnosis. In the recent years, high-dose chemotherapy with hematopoietic stem cell transplantation has become the preferred treatment for patients under the age of 65 years. Systemic chemotherapy usually controls oral lesions. Palliative radiotherapy for lytic jawbone lesions can also be used. The combination of thalidomide and dexamethasone, often in combination with melphalan, is one of the most common regimens for patients with newly diagnosed MM. Bisphosphonates reduce the risk of myeloma-related fracture, but bisphosphonate-related osteonecrosis of the jaws occurs in a small percentage of the patients. The prognosis of MM is poor, with a survival rate of approximately 3–10 years from the time of diagnosis. The combination of thalidomide and bisphosphonate was used in our case, and the patient showed reduction in the swelling and healed extraction socket after 3 months. Oral lesions are seen with some frequency in patients with MM, and this may be the initial sign of systemic disease. Dental surgeons can play a significant role in the early recognition of oral lesions with underlying systemic disease, thus preventing the morbidity and mortality associated with such pathologies. In addition, oral surgeons are expected to have a sound knowledge of this condition not only in the early detection, but also in the treatment of patients with MM, thus improving the quality of life of the affected individuals. The authors certify that they have obtained all appropriate patient consent forms. In the form, the patient has given his consent for his images and other clinical information to be reported in the journal. The patient understand that name and initials will not be published and due efforts will be made to conceal identity, but anonymity cannot be guaranteed. Neville BW, Damm DD. Oral and Maxillofacial Pathology. 3rd ed. Philadelphia: Saunders; 2008. p. 613-34. Nofsinger YC, Mirza N, Rowan PT, Lanza D, Weinstein G. Head and neck manifestations of plasma cell neoplasms. Laryngoscope 1997;107:741-6. Lae ME, Vencio EF, Inwards CY, Unni KK, Nascimento AG. Myeloma of the jaw bones: A clinicopathologic study of 33 cases. Head Neck 2003;25:373-81. Rao KS, Priya NS, Umadevi HS, Smitha T, Reshma V, Shebha G. Solitary bone plasmacytoma of the maxilla – A rare case report. Int J Clin Dent Sci 2011;2:37-40. Mirra JM. Bone Tumors: Diagnosis and Treatment. 2nd ed. Philadelphia: JB Lippincott; 1980. Millesi W, Enislidis G, Lindner A, Schobel G, Ewers R, Drach J, et al. Solitary plasmocytoma of the mandible – A combined approach for treatment and reconstruction. Int J Oral Maxillofac Surg 1997;26:295-8. Gupta M, Pal RA, Tikoo D. Multiple myeloma: The disease and its treatment. Int J Basic Clin Pharmacol 2013;2:103-21. Patil PB, Kamarthi N, Taneja N, Patil N. Multiple myeloma presenting as an intra-oral alveolar mass – A case report and brief review. Int J Oral Med Sci 2010;8:162-6. Ariyaratnam S, Sweet C, Duxbury J. Low grade multiple myeloma that presented as a labial swelling – A case report. Br Dent J 2005;199:433-5. Seoane J, Aguirre-Urizar JM, Esparza-Gómez G, Suárez-Cunqueiro M, Campos-Trapero J, Pomareda M, et al. The spectrum of plasma cell neoplasia in oral pathology. Med Oral 2003;8:269-80. Lee SH, Huang JJ, Pan WL, Chan CP. Gingival mass as the primary manifestation of multiple myeloma: Report of two cases. Oral Surg Oral Med Oral Pathol Oral Radiol Endod 1996;82:75-9. Bruce DW, Royer RQ. Multiple myeloma occurring in the jaws-a study of 17 cases. Oral Surg Oral Med Oral Pathol 1953;6:729-44. Epstein JB, Voss NJ, Stevenson-Moore P. Maxillofacial manifestations of multiple myeloma. Oral Surg Oral Med Oral Pathol 1984;57:267-71. Lambertenghi-Deliliers G, Bruno E, Cortellezzi A, Fumagalli L, Morosini A. Incidence of jaw lesions in 193 patients with multiple myeloma. Oral Surg Oral Med Oral Pathol 1988;65:533-7. Shah A, Ali A, Latoo S, Ahmad I. Multiple myeloma presenting as gingival mass. J Maxillofac Oral Surg 2010;9:209-12. Anil S. Solitary plasmacytoma of the maxilla – a case report and review of the literature. Gen Dent 2007;55:39-43. Obuekwe ON, Nwizu NN, Ojo MA, Ugbodaga PI. Extramedullary presentation of multiple myeloma in the parotid gland as first evidence of the disease – A review with case report. Niger Postgrad Med J 2005;12:45-8. Higurashi M, Yagishita S, Fujitsu K, Kitsuta Y, Takemoto Y, Osano S, et al. Plasma cell myeloma of the skull base: Report of two cases. Brain Tumor Pathol 2004;21:135-41. Wavre A, Baur AS, Betz M, Mühlematter D, Jotterand M, Zaman K, et al. Case study of intracerebral plasmacytoma as an initial presentation of multiple myeloma. Neuro Oncol 2007;9:370-2. Anda T, Baba H, Yonekura M, Moriyama T, Teramoto S, Fujii H, et al. Acase of multiple myeloma associated with a large subcutaneous mass in the frontal region. No Shinkei Geka 1994;22:455-60. Vieira-Leite-Segundo A, Lima Falcão MF, Correia-Lins Filho R, Marques Soares MS, López López J, Chimenos Küstner E, et al. Multiple myeloma with primary manifestation in the mandible: A case report. Med Oral Patol Oral Cir Bucal 2008;13:E232-4. Di Micco P, Di Micco B. Up-date on solitary plasmacytoma and its main differences with multiple myeloma. Exp Oncol 2005;27:7-12. Pinto LS, Campagnoli EB, Leon JE, Lopes MA, Jorge J. Maxillary lesion presenting as a first sign of multiple myeloma: Case report. Med Oral Patol Oral Cir Bucal 2007;12:E344-7. Gardais J, Geneviève F, Foussard C, Delisle V, Zandecki M. Is there any significance for intracellular crystals in plasma cells from patients with monoclonal gammopathies? Eur J Haematol 2001;67:119-22. Souza LN, Farias LC, Santos LA, Mesquita RA, Martelli H Jr., De-Paula AM, et al. Asymptomatic expansile lesion of the posterior mandible. Oral Surg Oral Med Oral Pathol Oral Radiol Endod 2007;103:4-7. Jose M, Balan A, Sharafuddeen KP, Kumar NR, Haris PS. Case reports mandibular lesion presenting as the first sign of multiple myeloma – A report of two cases. Int J Dent Case Rep 2011;1:22-8.